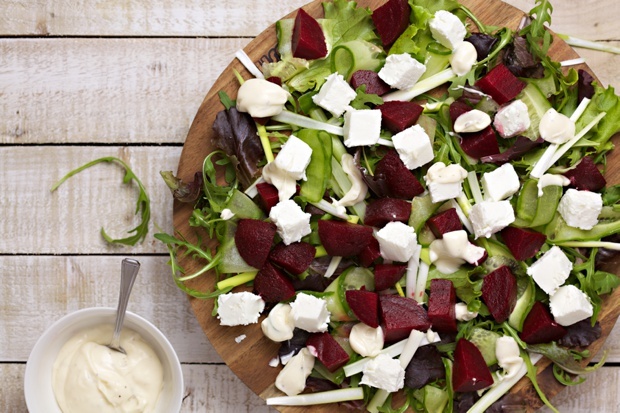 Creamy goat cheese and flavorful beets, with a simple dressing make this healthy salad a taste delight. 1 Slice the beetroot into small cubes. Slice the cucumber lengthways with a potato peeler. 2 Mix the dressing ingredients together in a small bowl. 3 Arrange the salad leaves, beetroot, onions and cucumber on a platter, or plates. Cut the goats cheese into small pieces and dot over the salad. Sprinkle over with pecans and, finally, drizzle the dressing over the salad.